I’ve only recently discovered the Japanese recipe website Cookpad; it’s full of both traditional and modern recipes all provided by the Japanese public. Of course, I don’t read Japanese so I’m eternally grateful to the the translators who do translate the more popular recipes to English. On the Japanese site, the collection is currently at over 1.5 million recipes and at the time of writing, over 18,000 recipes have been translated – that’s still more than one could ever try to cook in a lifetime! It was on Cookpad (and all the browsing through recipes I’ve done on the site) that I encountered this very simple way of presenting a Japanese nabe: sliced pork and sliced Chinese cabbage are placed upright in layers to great effect. The recipe I present below is a very simple one, with very few ingredients, and it feels quite light and healthy for a cold day (June, what is wrong with you?!). The presentation makes it feel that bit more special. Slice the pork loin crosswise as thinly as possible (this will be easier if it’s half frozen). Marinate it with a little soy sauce and a little rice wine. Slice the Chinese cabbage into wide strips crosswise. 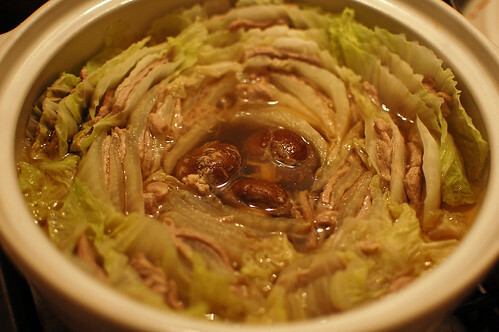 Layer the cabbage and pork together, alternating the layers, in a large clay pot (nabe) as in the photo. Pour over the chicken stock and season with salt and white pepper, if desired. A little soy sauce here wouldn’t hurt either. You’ll see that I also put in some mushrooms that I had lying about; some spring onions would be good too. Place the lid on the nabe and place it over high heat. When it all starts steaming, reduce the heat and let it all simmer until everything is cooked. 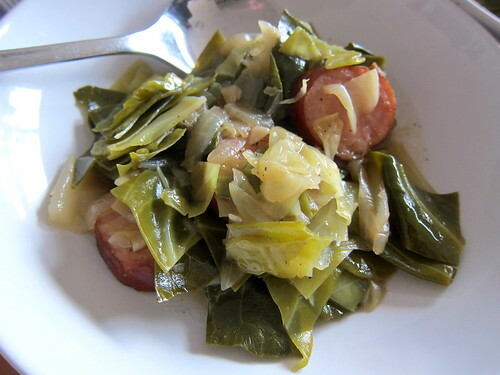 Serve with lots of white rice.